I am having some issue interpreting the following AC phase plot. The AC gain plot is ok, rolling off at high frequencies, but what about the AC phase plot which increases from 0 towards 180 degrees at higher frequencies ? Note: The current input stimulus and feedback resistor is configuring the inverter as a transimpedance amplifier. It’s to avoid disturbing the dc bias. Just trivial. Cgd acts as feedforward path respectively causes a right-halfplane zero. Draw an equivalent circuit and you'll see. No, I just found out that the V(out)/V(in) has an increasing gain, and a decreasing phase. I am bit surprised at the increasing AC gain magnitude for V(out)/V(in) . Any idea why ? * Supply voltage only 1volt DC? Why so low? * Input signal is a current I1. Why not a voltage? * What is the purpose of the output current source I2? I just found out that the V(out)/V(in) has an increasing gain, and a decreasing phase. You are right, positive gain > 1 means that it's no simple Cgd feedforward effect. I didn't look at the gain magnitude graph. Positive gain > 1 at high frequency is also achieved in this circuit with higher supply voltage and capacitively coupled AC voltage source, there's apparently something special about the transistor model. 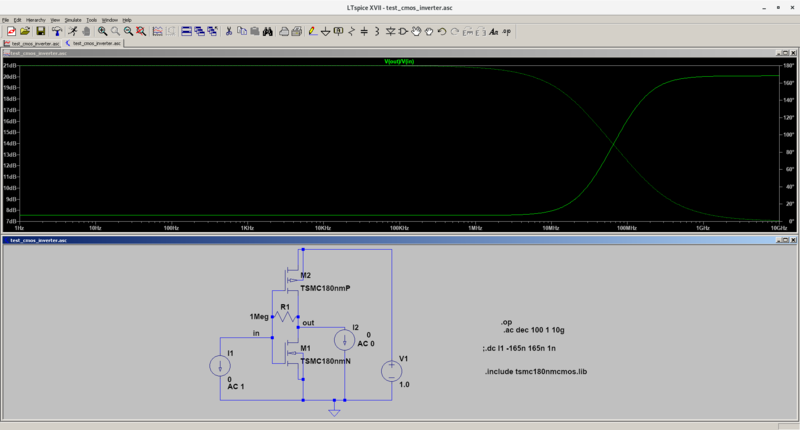 The middle plot is the input impedance, why does it start low ? 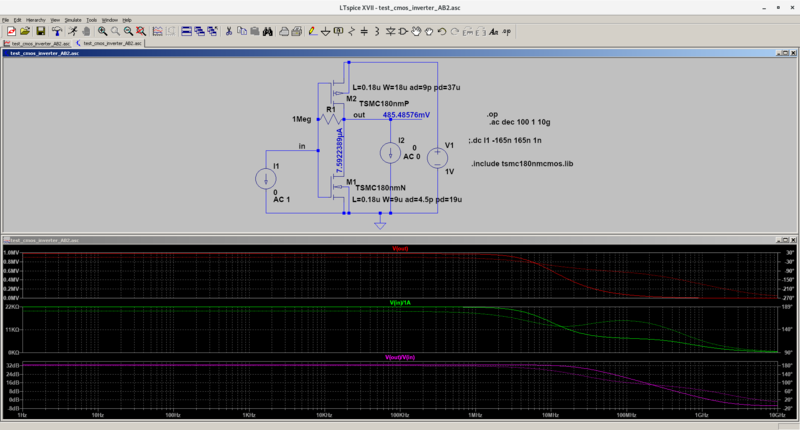 For those who are interested in simulation of the above circuit, please see the attached asc file and mosfet library. It starts at about 44 kOhm = R1/Vinverter. Why 44 kOhm = R1/Vinverter ? Sorry for being unclear. Vinverter means inverter gain. 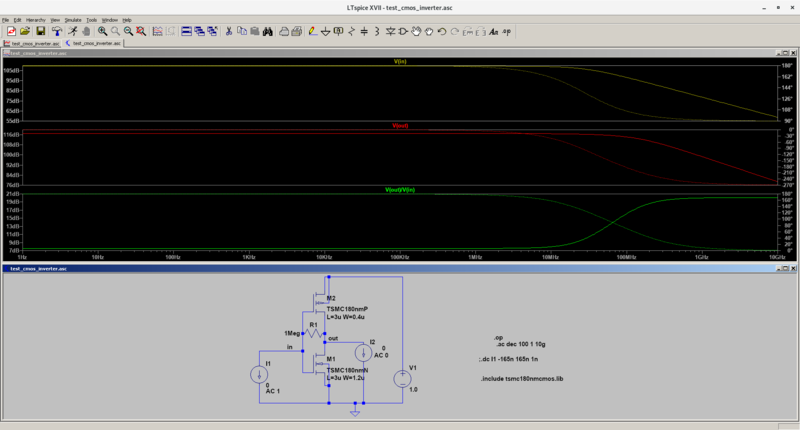 It's shunt-shunt negative feedback (voltage controlled current feedback), reducing the input impedance. Rin = R1 / (| Gain | +1). At higher frequencies, the output capacitor reduces the gain and Rin -> R1. but why Rin drops again after 2MHz ? 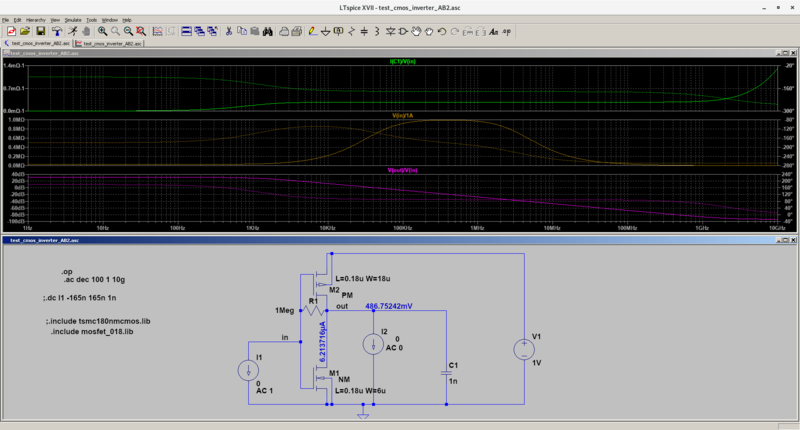 Due to MOSFET Cgs and Cgd. 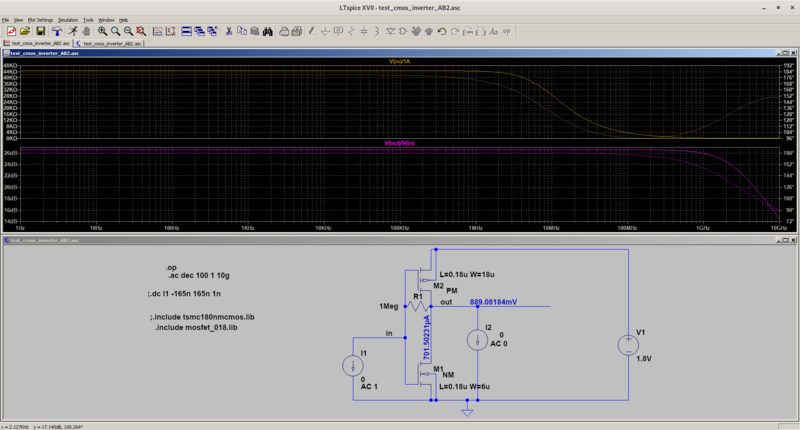 Why all three waveform plots changes so much by just increasing supply voltage from 1.0V to 1.8V ? Removing the large output capacitance C1 (1n) makes more sense. 1) But why input impedance starts with 44kOhm at low frequencies range ? Any way to calculate this value ? 2) Besides, why the phase of the input impedance starts rising again after 200MHz to 150 degrees ? 3) How would I measure overall transconductance (Gm) of this CMOS inverter using input AC current source stimulus (I1) and feedback resistor (R1) ?